The Chop Down Secret Technique is needed in order to cut down trees blocking certain paths across the Kanto Region - effectively replacing HM Cut found in previous Mainstream Pokemon Games - most notably the ones preventing your trainer from challenging the Vermilion City Gym when you first arrive into said city. In order to obtain the Chop Down Secret Technique for your Starter Partner Pokemon, you will have to jump aboard the S.S. Anne in the harbor just south of Vermilion City. In one of the rooms within the cruiser, you will find the Captain of the S.S. Anne who is feeling seasick. 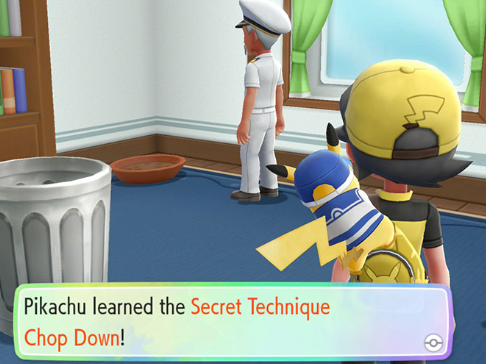 By helping him out with the simple gesture of rubbing his back, he will teach your Starter Partner Pokemon the Chop Down Technique.